I think iframes are a critical trust boundary for web applications that is missing right now: CSRF is an example threat and also identifies a bunch of data flows. A bunch of iframes join into a browsing context (which has a few flows that can only occur inside a browsing context). Additionally, I would call them origins instead of sites. Also, I wonder what you think of http://devd.me/papers/websec-csf10.pdf While admittedly more focused on automatic analysis, the “logical model” discussed in earlier sections of the paper sounds quite related. 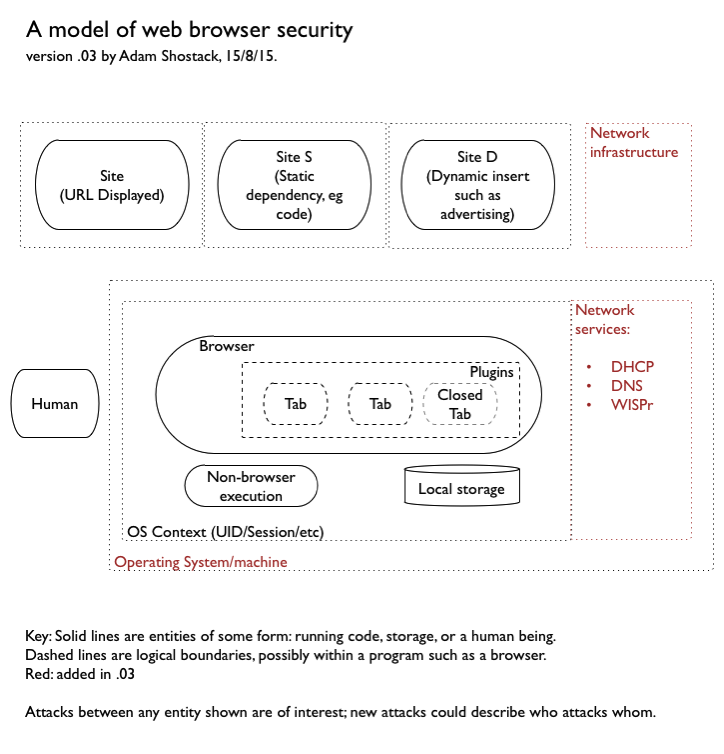 Thanks for contributing this model of web browser security. An important boundary (not depicted in the current revision of the diagram above) exists between the components running inside and outside the browser sandboxes (e.g., Chrome renderer sandbox, Firefox content process sandbox). Wouldn’t you want to show both the rendering and (Java)script engines and possibly execution done directly on GPU? Link to “Protection Profile for Web Browsers” is broken. Please don’t forget to include this giant mess of a parser[1-2] which is the most insecure thing in a browser. What Good is Threat Intelligence Going to do Against That?